From time to time somebody just misses a painting they really wanted to buy, or for some other reason have wanted something specific. 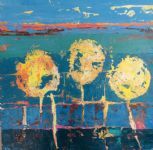 I have done paintings as commissions if I think I will enjoy the challenge of a suitable new piece of work. Here are some examples, so please ask if you think this could be a possibility. St Mary's Lighthouse sold from NoEAC exhibition just before another buyer came back to buy it. I was happy to make a new painting of the same local landmark for the customer. And the larger version was a commission for a Northumbrian living in California. 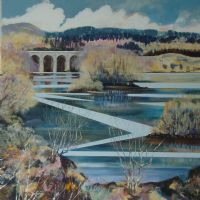 The Interior designer for Wetherspoon's loved my Kielder Viaduct painting for a new pub fit-out in Cramlington. However it was too small for the public space. The new larger version hangs above the pub fireplace at a better scale for the public dining room. Similarly, my small(30cmx30cm) painting of Curry's Point was not big enough for the reception area of a North Tyneside Hospital. The larger version captured the local view in similar palette. 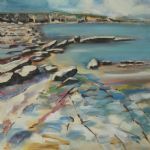 The first Lindisfarne Castle hangs in the same North Tyneside hospital reception as Curry's Point (above) a friend saw this before it was delivered to the hospital and loved the jewell-like quality of the rocky foreground and the blue and bright yellow palette. I made a new version of this abstract 'Mopheads' for our new apartment, so not a commission but another example of the sort of result that might come from basing a new painting on another with changed size and palette.